This mandelic acid face peel is of the buffered variety. Buffering raises the pH level of the acid so that it does not react too quickly to be dangerous. Mandelic is excellent for all skin types including Rosacea (at 22%). A large molecule equals less irritation. All skin types. Excellent for Fine lines, Acne-Rosacea, Pigmentation and ACNE! Antibacterial and antiseptic. Prepare your skin with exfoliating products (Retinol/RetinA/Glycolic Serum) for at least 2-3 weeks prior to beginning your regimen. **Fact! - Mandelic has a very large molecule which gives it is low irritation factor - but it has a stronger pk level than glycolic acid - and that gives it great "action". Mandelic is derived from an extract of bitter almonds, but will not cause allergic issues. Rosacea treatment (*Only the 22, not the 40) due to its ability to reduce inflammation. Treating mild to moderate acne (both comedonal and inflammatory). Antibacterial acne treatment which works by stopping growth of skin bacteria that causes acne and by keeping the pore follicles clear. Skin pigmentation treatment including Melasma and post-inflammatory pigmentation - particularly those with darker skin types. Alternative to hydroquinone due to its Tyrosinase inhibition properties (reducing melanin production). With Mandelic acid there is only a light amount, to no visible peeling. Mandelic is considered a Superficial peel. It can penetrate through the Stratum Corneum, the Stratum Granulsome and possibly into the Stratum Basale layer at higher strengths. Peeling should be completed within 3-7 days. There is not truly any "down time" related with this acid. You may consider a bit of dryness "social downtime". The absence of flaking does not mean that this acid isn't working though. Flakes are not necessary for changes to occur within the skin. This is the perfect peel for someone that wants refreshed, new and glowing skin, but doesn't want to deal with the dryness and flakes a stronger peel will have. Once your skin has acclimated to the 40% you may want to try TCA 13 for more visible peeling. View our simple chemical peel demonstration. Watch us perform a peel. It's very simple. Dry. Apply 1-2 layers of Peel Prep Solution A.
PSC has transformed my skin. I look better at 46 than I did in my 20's. More toned, greater clarity, a general vibrance in my skin that gets compliments often. I recently added this peel to my protocol, using it once per week with fantastic results. 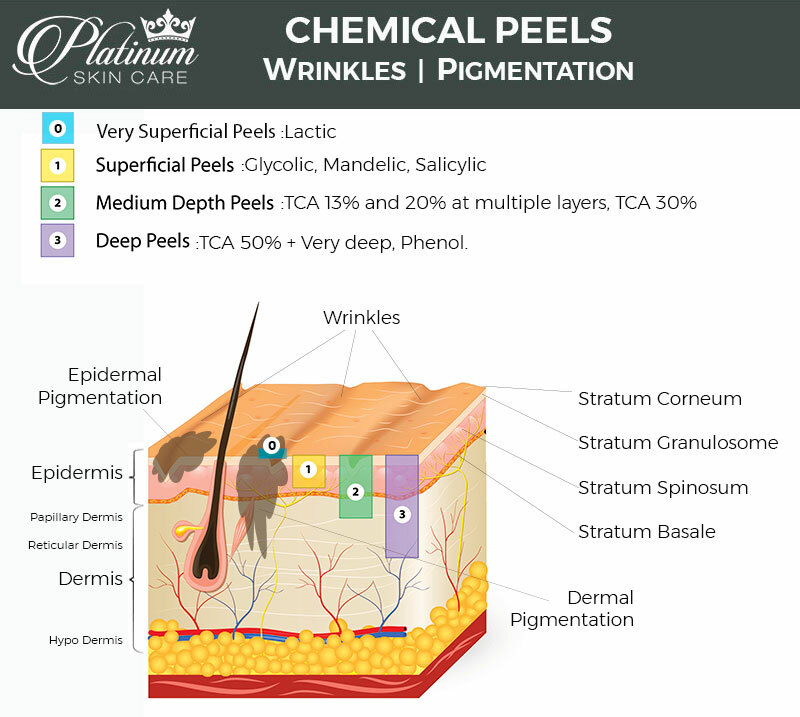 I am a fan of the glycolic, TCA, and salicylic peels, but this new peel produces super results with no redness or peeling. I highly recommend this peel! *Results vary depending on individual needs and product usage. Please see us for personal recommendations. LOVE THIS STUFF I have tried other products with Mandelic Azelaic and it was just ehhh. This stuff however works fantastic with my skin. I get super oily in the summer months and I just HATE my skin. We have already had some warm days and this has really helped with the oil production and is keeping my pores small. I will never be without this stuff. I know I am only to use this once a week... but I have used it several w/o any negative issues.. all I know it's keeping my face clearer than it's ever been and I love it! *Results vary depending on individual needs and product usage. Please see us for personal recommendations. GREAT PEEL FOR OILY SKIN LOVE LOVE LOVE This peel it has help me be acne free! I highly recommened it! AMAZING!!!!!! Thank you Platinum Skin Care. *Results vary depending on individual needs and product usage. Please see us for personal recommendations. First time I ever used this, And have finished second peel. I left it on a little longer and two days later I am starting to peel. Definetly exfoliates and I'll need much more time to see if this addresses hyper-pigmentation issues. So far, I think I like it better than the Glycolic. *Results vary depending on individual needs and product usage. Please see us for personal recommendations. I love this product! When I use it my skin looks 5 years younger and people around me notice!! *Results vary depending on individual needs and product usage. Please see us for personal recommendations. Platinum Skin Care Mandelic Acid | Who is it for? | What Percentage do you need?